Cisco TrustSec technology protects assets such as data, applications, and mobile devices from unauthorized access. It simplifies the provisioning and management of network access, accelerates security operations, and consistently enforces policy anywhere in the network. The Cisco TrustSec solution simplifies the provisioning and management of highly secure access to network services and applications. Unlike access control mechanisms that are based on network topology, Cisco TrustSec policies use logical groupings. Highly secure access is consistently maintained even as resources are moved in mobile and virtualized networks. Decoupling access entitlements from IP addresses and VLANs simplifies security policy maintenance tasks, lowers operational costs, and allows common access policies to be consistently applied to wired, wireless, and VPN access. Cisco TrustSec classification and policy enforcement functions are embedded in Cisco switching, routing, wireless LAN, and firewall products. 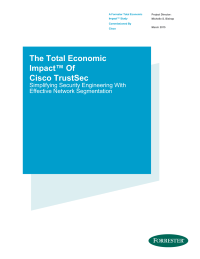 By classifying traffic according to the contextual identity of the endpoint instead of its IP address, the Cisco TrustSec solution enables more flexible access controls for dynamic networking environments and data centers. The ultimate goal of Cisco TrustSec technology is to assign a tag (known as a Security Group Tag, or SGT) to the user’s or device’s traffic at ingress (inbound into the network), and then enforce the access policy based on the tag elsewhere in the infrastructure (in the data center, for example). This SGT is used by switches, routers, and firewalls to make forwarding decisions.